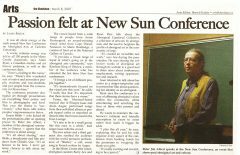 It was all about energy at the sixth annual New Sun Conference on Aboriginal Arts at Carleton University. 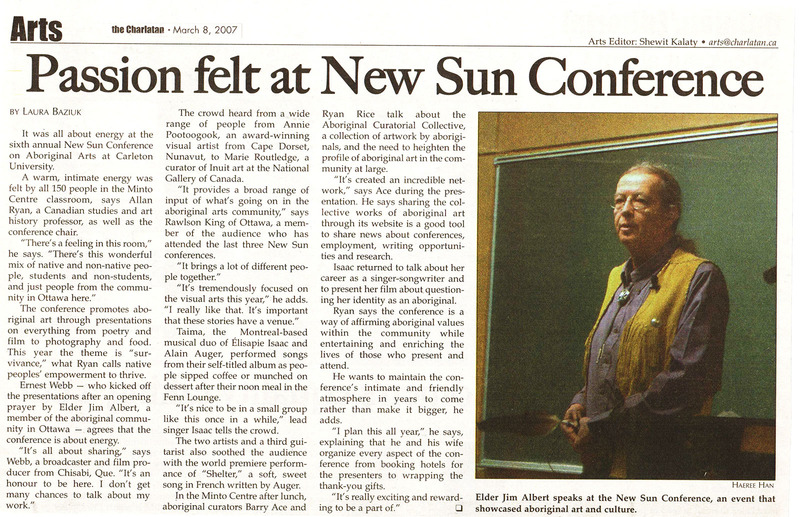 A warm, intimate energy was felt by all 150 people in the Minto Centre classroom, says Allan Ryan, a Canadian studies and art history professor, as well as the conference chair. The conference promotes aboriginal art through presentations on everything from poetry and film to photography and food. This year the theme is “survivance,” what Ryan calls native peoples’ empowerment to thrive. Ernest Webb—who kicked off the presentations after an opening prayer by Elder Jim Albert, a member of the aboriginal community in Ottawa—agrees that the conference is about energy. The crowd heard from a wide range of people from Annie Pootoogook, an award-winning visual artist from Cape Dorset, Nunavut, to Marie Routledge, a curator of Inuit art from the National Gallery of Canada. “It provides a broad range of input of what’s going on in the aboriginal arts community,” says Rawlson King of Ottawa, a member of the audience who has attended the last three New Sun conferences. Taima, the Montreal-based musical duo of Elisapie Isaac and Alain Auger, performed songs from their self-titled album as people sipped coffee or munched on dessert after their noon meal in the Fenn Lounge. “It’s nice to be in a small group like this once in a while,” lead singer Isaac tells the crowd. The two artists and a third guitarist also soothed the audience with the world premiere performance of “Shelter,” a soft, sweet song in French written by Auger. In the Minto Centre after lunch, aboriginal curators Barry Ace and Ryan Rice talk about the Aboriginal Curatorial Collective, a collection of artwork by aboriginals, and the need to heighten the profile of aboriginal art in the community at large. “It’s created an incredible network,” says Ace during the presentation. He says sharing the collective works of aboriginal art through its website is a good tool to share news about conferences, employment, writing opportunities and research. Isaac returned to talk about her career as a singer-songwriter and to present her film about questioning her identity as an aboriginal. Ryan says the conference is a way of affirming aboriginal values within the community while entertaining and enriching the lives of those who present and attend. He wants to maintain the conference’s intimate and friendly atmosphere in years to come rather than make it bigger, he adds. “I plan this all year,” he says, explaining that he and his wife organize every aspect of the conference from booking the hotels for presenters to wrapping the thank-you gifts.